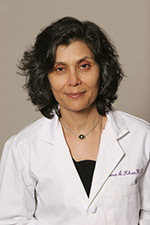 Seema Khan, MD, professor of surgery, found a new skin gel that reduced the growth of cancer cells minimizing dangerous side effects. A gel form of tamoxifen applied to the breasts of women with noninvasive breast cancer reduced the growth of cancer cells to the same degree as the drug taken in oral form but with fewer side effects that deter some women from taking it, according to new Northwestern Medicine research. The paper was published in Clinical Cancer Research on July 15.